Hispanics are significantly more likely than whites to say the Earth is warming because of human activities and that the U.S. should do whatever it takes to protect the environment, a new Pew Research Center analysis finds. Our analysis finds that Hispanics, who make up an increasing share of the U.S. voting population in presidential elections, stand out when it comes to their views of the environment. Recent surveys from other organizations have had similar results. Democrats, the party most Hispanics identify with, have been pushing for more government action on issues such as climate change. This week, President Barack Obama vetoed the Keystone XL pipeline, even as a majority of Americans – and about half of Hispanics – support the project. In a recent survey, we ask if there is solid evidence that the Earth has been warming over the past few decades. 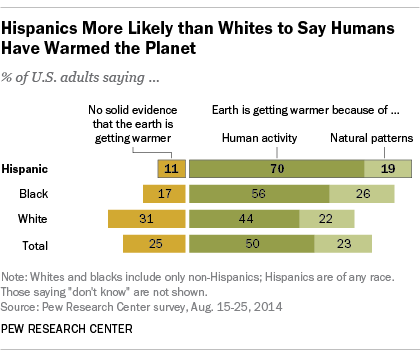 Seven-in-ten Hispanics say the Earth is warming because of human activity, a higher share than among whites (44%). More than half (56%) of blacks say the same. About two-in-ten Hispanics and whites and a quarter of blacks say the Earth is warming because of natural patterns. Overall, a quarter of Americans say there is no solid evidence of global warming. Just 11% of Hispanics and 17% of blacks say there is no solid evidence the Earth is getting warmer, while 31% of whites say the same. The finding about Hispanics comes as the overall share of Americans who say there is evidence of warming has fluctuated over the past decade. In 2006, 77% of U.S. adults said there is solid evidence of global warming. That share dropped to 57% in 2009 before rising to 72% in 2014. In addition, a significant share of Hispanics say they favor strong action to protect the environment. In a 2014 Pew Research Center survey, respondents were asked to say which statement comes closer to their views: “This country should do whatever it takes to protect the environment” or “This country has gone too far in its efforts to protect the environment.” Three-quarters (76%) of Hispanics chose the first statement, compared with 84% of blacks and 67% of whites. So why do Hispanics (and, to some extent, blacks) stand out? One possibility might lie in the age of the Hispanic population. With a median age of 27 years, Hispanics are significantly younger than whites (42), blacks (33) and the nation as a whole (37). Overall, younger Americans are more likely than older Americans to say the Earth is warming because of human activity. Six-in-ten Americans ages 18-29 say the Earth is warming due to human activity, compared with 31% of those ages 65 and older. Another possible explanation for these trends is differing political preferences by race and ethnicity. Those who identify with or lean toward the Democratic Party are significantly more likely than those who prefer the Republican Party to say the Earth is warming because of human activity (by 71% to 27%) – and Hispanics and blacks are more likely to lean Democratic than whites. About 54% of Hispanics and 81% of blacks identify with or lean toward the Democratic Party, compared with 40% of whites. Recent surveys have highlighted a similarly high concern for environmental issues among Hispanics. A New York Times survey found that more than half (54%) of Hispanics said global warming is an extremely or very important issue to them personally, compared with 37% of whites. And nearly two-thirds (63%) of Hispanics said the federal government should act broadly to address global warming, compared with 49% of whites. Another survey from the Chicago Council on Global Affairs also found high concern among Hispanics over global warming. More than half of Hispanics (54%) called climate change a critical threat to U.S. vital interests in the next 10 years, compared with 32% of non-Hispanics. A similar share of Hispanics (54%) said the U.S. government is not doing enough on climate change, compared with 49% of non-Hispanics.